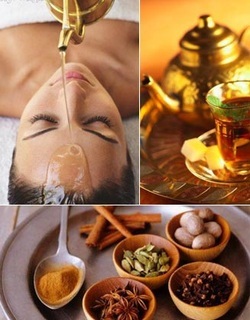 Ayurveda, the very word conjures up images of Kerala, where it originated and is practiced religiously. It literally means 'Science of Life', which is based on the principles of wholeness and balance. Its history spans over 5000 years. The state of Kerala is famed the world over for its rejuvenating Ayurveda and attracts tourists from far and wide. Leave behind your monotonous hectic life and surrender to blissful massages at this enchanting state. No doubt you will go back completely rejuvenated and remember the experience for the rest of your life. It is believed that this system of medicine was taught to human beings by the heavenly deities themselves. It is an ancient system of medicine dating back to around 5000 years ago. On your tour to Kerala do go for a massage and you will surely feel rejuvenated. A variety of natural herbs are used in it. Apart from relaxing body and mind, the massages and therapies lead to sharp memory and strong immunity. It promotes longevity in four ways: through physical, mental, spiritual and lifestyle changes. This system of medicine can heal any ailment of body and mind. On arrival at Cochin airport / Ernakulam Railway station, you will be greeted by our representative and will transfer you to Hotel. PM: We take you for a half day sightseeing of Cochin, Visit: The Dutch Palace, Jewish Synagogue, Jews Street, St.Francis church, Chinese fishing net & the indo-Portuguese Museum. Later transfer you back to Hotel. Evening we take to show Kath kali dance (ancient dance of kerala - Optional). Overnight stay at Hotel. After breakfast depart Cochin and transfer to Chamundi hill130 Km 4 Hrs), Check in at resort Lunch, evening Ayurveda Massage" abhyangam treatment" which is a gentle but firm whole body Ayurveda massage from head to toe using warm medicated oil. Oils are chosen by the Ayurveda expert according to the prakruti the ingredients for the Abhyanga body Massage are prepared together with soothing oils. The massage is done in a soft rhythmic way with one or two persons massaging at the same time for forty five to sixty minutes. Ladies are treated by a female therapists; gentlemen by male therapists. Ayurveda resort after breakfast continue abhyangam treatment afternoon visit neighboring Tea gardens, overnight at Resort. Ayurveda resort after breakfast continue abhyangam treatment afternoon at leisure, overnight at Resort. After breakfast check out from Hotel and we drive down to Kumarakom. On arrival at Kumarakom visit the Kumarakom Bird Sanctuary and later check in at hotel in, Evening go for Sunset cruise (optional) or enjoy the beauty of backwater by just relaxing near Vembanadu Lake. AM after breakfast and we transfer you to -Cochin airport. End of Tour / servicesIn This way You Will Enjoy a Great Kerala Ayurveda and Back Water tour With Us. Anything Not Mentioned in Kerala Ayurveda and Backwater Tour Cost Includes.